I like to try Egg curry in different ways. once i watched this ceylon egg curry on a television cookery show and loved the idea of steaming the eggs and using in curry. 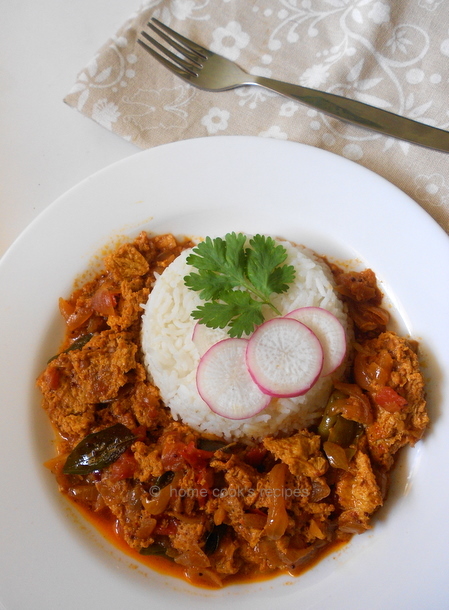 i have tried it twice and we liked this ceylon egg curry very much. though i did'nt get perfect steamed egg cakes, the taste was no compromise. If i have used some 5 or 6 egg's i could have got perfect egg cakes. since i used 3, it was not enough for the egg cake to raise. 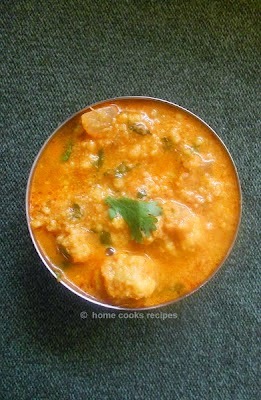 On googling i found a similar type of dish called egg dhoka is prepared in Bengal. 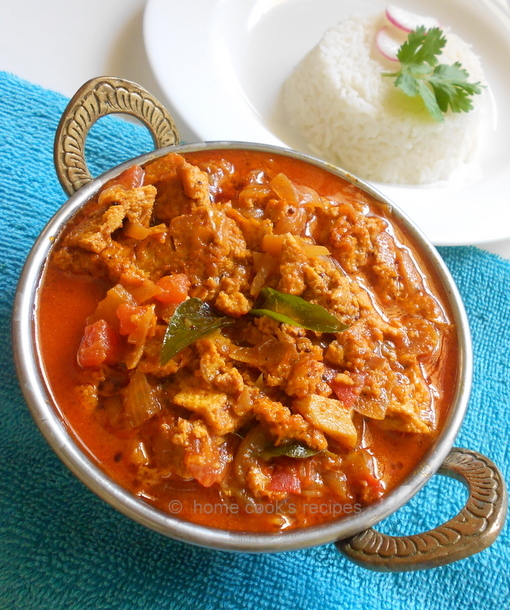 You can also refer here for a Dry Egg curry from here. I love Ceylon Egg Parotta, This Ceylon Egg Curry is not as famous as parotta in our Indian restaurant menu cards, but its easy to try at home. What makes this curry unique and special is, the eggs are steamed and cut into sqaures and put in curry. 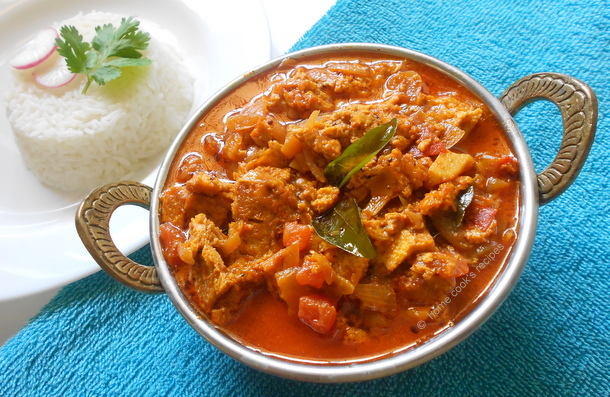 The curry will be spicy as well rich with coconut milk. Coconut Milk - 1 cup (150 ml) / coconut milk extracted from half of a coconut. To prepare Egg Cake, use Pressure cooker. First Beat the Egg's with a pinch of salt. Grease a small round bowl and add the beaten eggs into it. Add 1 cup of water to the Pressure cooker and place the egg bowl inside the cooker. make sure to close the bowl. let it be in medium flame for about 3 or 4 whistles. it takes some 10 minutes time. after 4 whistles, switch off the flame and let the cooker rest till the the steam escapes. then open the cooker and take the bowl from it. now cool the egg cake and cut them into squares. 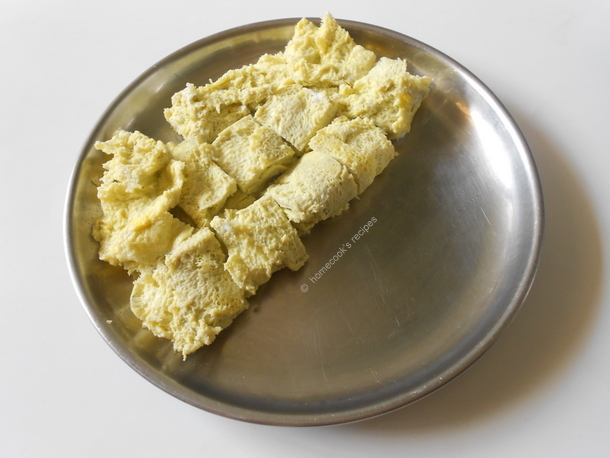 Heat Oil in a Pan or Kadaai. add mustard, sombu and cinnamon, let the mustard splutter and add curry leaves. then add finely chopped onion's and saute it till it turns translucent. then add slitted green chilly and ginger garlic paste and saute along with onions. then add chopped tomatoes and mix well with the onions. Add turmeric powder, salt to taste and red chilly powder and corriander powder and mix well with the onions and tomatoes. Once the masala's are nicely mixed up with the onions, the add the steamed egg cake squares. and mix well with masala's. Add little water and coconut milk in slow flame. Let the curry boil for few minutes. After 4 or 5 minutes in slow flame. 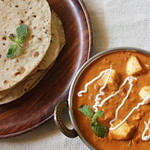 remove the curry to a serving dish and garnish with corriander leaves. 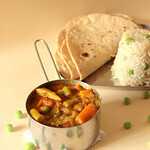 Serve with Hot Rice and with some Vegetable or Pappad as side. wow too good curry..hv never heard abt steaming egg n making them into curry delicious curry perfect for hot rice.. thanks for sharing this wonderful recipe.. in my to do list!!! we often make this when run out of required quantiyt of eggs. looks lovely. Awesome looking egg curry. Steamed egg cakes absorb the gravy better for a yummy dish.. Lovely pics. Very interesting! Sounds and looks wonderful! Egg Curry looks to be awesome and delicious. can i steam it in a rice cooker? Outstanding egg curry, beautiful spread here. 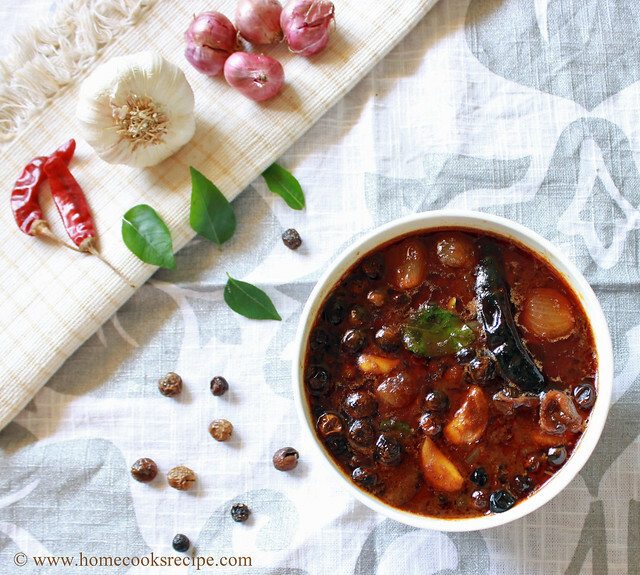 Thanks Sharanya, will try next time, also i will update this in the recipe.